The Beauty Scoop: Introducing PhytoSpecific! We all love phytologie! I mean they really do stand true to their slogan of "perfect ingredients, perfect hair." So, we couldn't be happier to announce their brand new Phytospecific products! 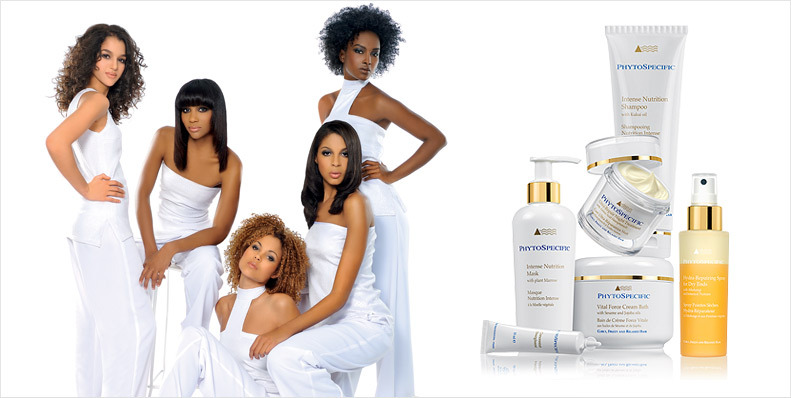 For the Phytospecific products, the slogan is "specific ingredients, specific hair." That's because this line was specially formulated for textured hair in mind to nourish and repair naturally curly, frizzy, and/or relaxed hair. A few of the girls at work had been anxiously waiting to try these products, so I chatted directly with them to get their personal feedback. Both of the gals tried the Phyto PhytoSpecific Intense Nutrition Mask and the Phyto PhytoSpecific Nourishing Styling Cream. Below is what they had to say on these two amazing products! PHYTOSPECIFIC INTENSE NUTRITION MASK: Both of the girls stated that the product worked wonderfully and provided much needed oils to their hair. One of the ladies even said that her hair instantly felt smooth upon application and she could "feel the tangles loosening". She's already added this into her weekly regime! PHYTOSPECIFIC NOURISHING STYLING CREAM: Direct quote from one of the gals "Absolutely love love the nourishing styling cream!" This is an amazing leave in product that AGAIN both girls are adding to their beauty regime. A few tips from the ladies is to use this product when your hair is wet for best results. One of the ladies also recommended to use sparingly around the roots to avoid access, unwanted oils. The Phyto PhytoSpecific Ultra Repair Night Treatment was only used by one of our participants and she LOVED this product too! She even used the product in the morning as well and it worked awesomely as a moisturizer and frizz control product! Wanna try one of these amazing products? Just use code: 15HAIR at checkout and receive 15% off! AND, as always, receive FREE shipping and FREE samples!